Thinning hair is a thing. It’s a thing we don’t want to think about, let alone talk about, but it is a reality. One estimate suggests that 40% of the people who experience hair loss are women. This forum is a lighthearted beauty blog not intended to delve into the mysteries of the universe or the intricacies of social perceptions, but the reality is that how we look matters not only to us, but to the world around us. Shifts in those appearances are earth-shattering for our self-perception. When the subject is as sensitive as hair, considered one of our most feminine traits, any change feels infinitely more threatening. How do we cope with hair loss? Thinning hair can be caused by any number of things, including up to 30 illnesses alone. All vanity aside, if you are experiencing sudden hair loss in conjunction with ANY other symptom, talk to a healthcare professional. Seriously. 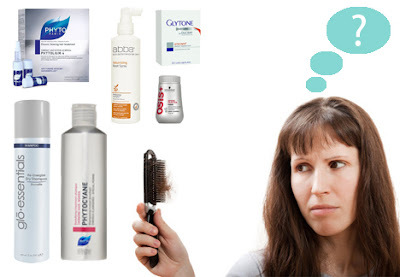 Other causes of hair loss run the gamut from stress and trauma to pregnancy and medications or to heredity. The causes are numerous. Addressing thinning hair is usually best dealt with after learning the specific cause. She was asking in reference to two of the Phyto treatments we carry, the Phytocyane treatment and the Phytolium treatment. While at first glance, the answer seemed clear (chronic means it’s a constant problem, temporary means it is due to a specific event), the details remained hazy. When did your thinning hair start? It’s hard to pin down, right? Maybe you think it has to do with pregnancy or menopause, but how can you really be sure? And if it is menopause, is the hair loss a temporary thing, or is it chronic from now on? At this point I’m assuming you’re going to take my advice from above – Go talk to a Doctor! I, instead, called Phyto. The Phyto rep and I had a long conversation both about my customer’s question (she had been using Phytocyane for years and was curious about switching to Phytolium) and about hair treatments in general. Here’s what I learned: If you don’t know what the underlying issue is, it’s going to be that much harder to address it. The fact that her hair loss had been going on for years indicated that Phytocyane, for temporary hair thinning, was not the best choice for that situation. Further, as fantastic as Phyto treatments are, please, please follow the directions. The products are expensive and high quality and they are designed to work in really specific ways. They do not need to be applied to your scalp every day – and they won’t be more effective if you use them incorrectly. The directions for both of these treatments suggest 2 – 3 times per week for a cycle. For Phytocyane, that cycle is one month for an intensive treatment, 2 – 3 months for a maintenance treatment. For Phytolium, that cycle is 3 months. At the end of that period, both treatments suggest a rest period of at least one month before you begin treatment again. Beyond treatments, there are all sorts of supplements and products for you to try, but getting at the (excuse the pun) root of the problem is going to help you figure out what will work best. With some illnesses, getting healthy could be all you need to do to grow your hair back. If your hair loss is caused by a nutritional deficiency, maybe supplements are the way to go. If a lack of circulation to the skin in your scalp is the issue, maybe a topical treatment will work. If a hormonal imbalance is the problem, you can potentially explore a whole range of options. But the key is to know why it’s happening in the first place. There’s a whole can of worms there. Until you’re ready to explore those, maybe use Volumizing sprays or dusts and dry shampoos to boost your hair (and your confidence). Whatever you do, do it gently. You ARE beautiful, and you ought to treat yourself that way. Contact our beauty experts for any questions or needs, at customerservice@beautystoredepot.com!